A University of Manchester researcher has thrown new light on how the world famous Bayeux Tapestry was made over 900 years ago. Alex Makin –a professional embroiderer who was trained at one the country’s most prestigious institutions – says the same group of people were likely to have worked on the 70-metre-long masterpiece under the same manager or managers. Her conclusion casts doubt on the widely accepted theory that nuns based in different locations across England made the tapestry in nine sections which were then stitched together. 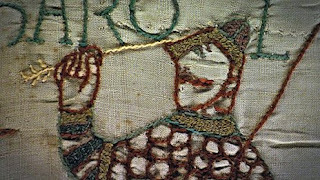 However, questions still remain over how many embroiderers worked on the Bayeux Tapestry, which is on permanent display at a museum in Normandy, France, who they were and where their ‘workshop’ or ‘workshops’ were located. From observing the way the stitches overlap on the back of the tapestry, Mrs Makin is also able to say in what order its different parts were sewn. The outlines for individual sections were worked first, and then filled in with colours in a set order.